Redken Blonde Icing Conditioning Cream Developer. 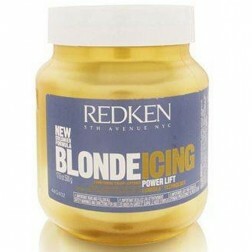 To be used with Redken Blonde Icing Ammonia Free Lightener and Redken Blonde Icing Power Lift Lightener. 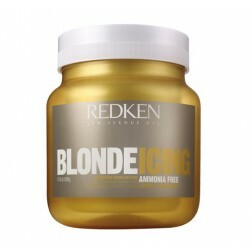 Redken Blonde Icing Conditioning Cream Developer is available in 20, 30 and 40 volume. Redken Blonde Icing Developer contains conditioning palm of derivative, which combines with the white beeswax in the lightener to form Cire-Gloss for luminous shine on lightened hair. 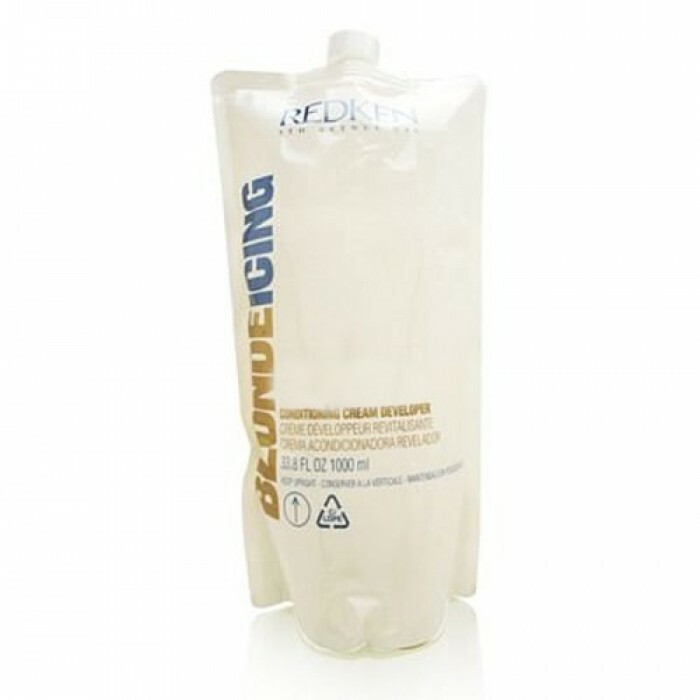 Redken Blonde Icing Conditioning Cream Developer should be mixed with Blonde Icing Conditioning Cream Lighteners (Ammonia Free or regular Power Lift formula). Blonde Icing Conditioning Cream Lightener has a variable mixing ratio, which ranges from 1:1 to 1:3. The mixing ratio you choose can vary depending on your preference and technique. A thicker consistency (1:1 or 1:2 ratio) is ideal for open air, freehand techniques when you want a lightener with strong adherence to the hair. A thinner consistency offers easier spreadability for on-scalp techniques (1:3 ratio). To simplify measuring, use the unique, calibrated Blonde Icing Scoop. One end holds 20 grams of lightener; the other, 20g of developer. When each side is filled with the mixture, it achieves a perfect 1:1 ratio. Using the Blonde Icing Scoop to measure, mix 20 g of Blonde Icing Conditioning Cream Lightener and Blonde Icing Conditioning Cream Developer in a 1:1, 1:2, or 1:3 ratio (20-60 grams of developer). Note: If the mixture thickens slightly in the bowl, simply re-stir; there's no need to add more developer. On-scalp Application: Process at room temperature until desired lightness is achieved for up to a maximum of 50 minutes. Do not use heat. Off-scalp Application: Process at room temperature until desired lightness is achieved for up to a maximum of 15 minutes. Do not use heat.